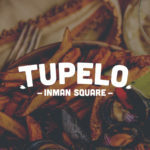 Tupelo has been serving up its own brand of “comfort food with a southern drawl” in Inman Square since its opening in 2009. Owners Renee McLeod (Petsi Pies) and Mike Walker started Tupelo with the goal of serving a new take on old favorites. Influenced by New England, Louisiana, and Virginia cuisine, Tupelo has won numerous awards and become a neighborhood treasure. Tupelo proudly serves desserts from Petsi Pies, with ice cream from Toscanini’s.